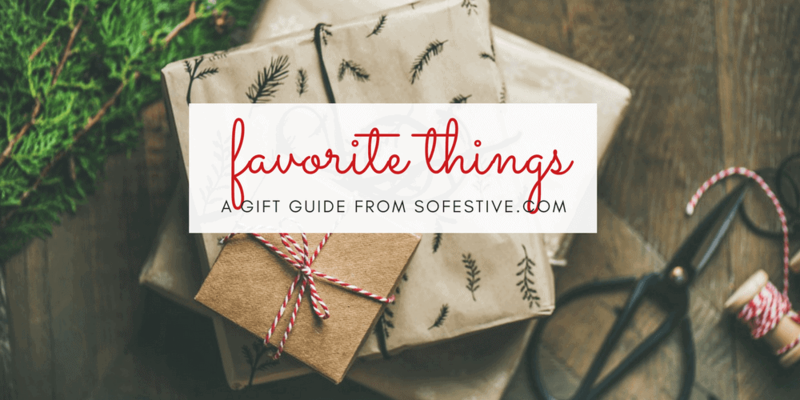 Last-Minute Gift Guide- Favorite Things - So Festive! Looking for a last-minute gift idea? I’ve rounded up our all-time favorite, tried-and-true items we LOVE and why we love them. Note: These are affiliate links. The cost is the same to you . I only recommend things I use and love. 1. One Night Ultimate Werewolf – We’ve had this game for a few years now and it’s still one of our all-time favorites. It makes an appearance at nearly every family reunion or party because it’s so fun. This game is quick, great for a group, and is easy to travel with. The only danger– you’ll probably end up playing for hours once you start. 2. Bang – Some good friends introduced us to this game many years ago and it’s also a favorite. We can play with a bigger group. It’s small and easy to travel with, but provides lots of fun as you try to remain the last one standing. 3. Dominion – My husband and I love that we can play this game with just the two of us, but that it can also be played with friends. There’s a bit of strategy to it, but it’s quick moving and every time you play is different. We love it. 2. 9×13 Baking Pan – I owned this pan for 14 years and just barely had to replace it. It’s my go-to baking pan for brownies, chocolate chip cookie bars, cakes, and casseroles. This version has a lid, which I love for keeping things fresh…and little one’s hands out. 3. Baking Sheet – I own 4 of these baking sheets and can’t speak more highly of them. I love how they cook evenly and are what I use for cookies, double batches of brownies, sheet cakes, and cinnamon rolls. 4. Meat Thermometer – I’m very picky when it comes to meat and ask my husband and he’ll tell you that I tend to overcook meat too much because I’m afraid of it not being cooked all the way. He gifted me this laser meat thermometer a few years ago and I LOVE it. I never have to guess if meat is cooked all the way through and it’s super easy to use. 5. Plastic Party Platter – I love nice serving ware, but I use this plastic party platter for picnics, potlucks, or keep it in the fridge stocked with veggies and dip. There’s a great spot for dip in the middle and I love that I don’t have to worry about it breaking! 6. White Cupcake Liners – there’s nothing fancy about these cupcake liners, but I love having a giant stash of these for muffins or cupcakes at a moment’s notice. There’s nothing worse when I go to make muffins or cupcakes and I have no liners! They are perfect for everyday use or when you want a clean, minimal look for a party that can easily be spruced up with cute toppers. 1. Canon 6d with wi-fi– This is my camera I use for all photo shoots and travel. I love it. And I especially love that it is wi-fi enabled which means I can instantly download photos from my camera to my phone to post to social media when I want to post something in real-time. It also makes it easy to share high-quality photos with friends on the spot instead of waiting until I have time to upload the images to my computer and then email. The video is great and all-around, and it’s the smallest and lightest full-frame sensor camera of the Canon line-up. 2. Canon 50mm 1.4 lens + Canon 24-70mm 2.8 lens – I only own 2 lenses, and these are them. Sure it would be fun to own more, but the combination of these two lenses gets the job done! The 50mm lens is my go-to lens for portraits and detail shots that I use for most posts on this blog. The 24-70mm lens is on my camera 90% of the time around home or when we are traveling. The range is great and I love that I can still get bokeh (blurry background) even if I’m zoomed in. 3. 60-inch lightweight Tripod – I don’t use my tripod a ton, so this light, and inexpensive version from Amazon does this trick just fine. It’s adjustable and comes with a small carrying bag, making all my crazy family photo shoots easy-peasy. 1. Globber scooter – this is hands down my children’s MOST USED toy. They fight over it like there’s no tomorrow. We also have a Micro Mini scooter, but for the price, this Globber version can’t be beat. So far, it’s held up just as well. 2. Boogie Boards – We keep these LCD screen drawing boards in our car and church bag for a small, mess-less activity to keep our children entertained. Think of it as the latest “magna-doodle.” Occasionally, I’ll steal one to make my day’s to-do list. These were one of the few toys we took on our 2-month adventure to Australia last Winter– they were great for the plane, car rides, practicing letters and still get used a lot at our house. 3, Golme Goals – My husband invested in these compact soccer goals for a soccer camp he hosted, but they’ve become a favorite toy that are pulled out at least once a week. We love how small they fold up and they are light and easy enough for our 5 year old to pull out on his own to play with. 1. Phone case– My husband’s gone through multiple phone cases over the years trying to find the best one, and this one has been his favorite. It’s inexpensive, classy looking, and has a spot for his credit cards, etc so he doesn’t have to carry a wallet as well. 2. Spinning Tie Rack – this has been a great, minimal solution to keeping my husband’s ties organized. These racks spin, making it easy to find the perfect tie. 3. Office Basketball Hoop – This mini basketball hoop has become a great stress-relief for my IT-nerd husband when he needs a quick break from the screen. It fits over his office door and has become a favorite with co-workers as well. 1. Ukelele- I bought this in the Fall because I wasn’t getting very far with my guitar skills and I’m sold! I can already play so many more songs that I ever could with years of guitar playing and I love how small and easy it is to take places. My favorites thing is being able to play and sings song to my children at night before bedtime. I can’t wait to play campfire songs come summer! 2. Home Laminator – I love having a laminator at home and use this laminator at least a few times a month, if not more around the holidays. It’s compact and small, so it doesn’t take up a lot of storage. I also love that it fits 12″ paper. 3. Silhouette Cameo – I held off getting a Silhouette digital cutting machine for a while, but it’s turned out to be one of my favorite party/holiday supplies. I love cutting last minute tags, card, or party decor. There are so many features I haven’t even touched, but the ease of use and versatility makes it easy to create nearly anything you can think of. And there you have it! A few fun gift ideas that will hopefully spark some inspiration for you! Free Printable Christmas Scavenger Hunt! Christmas Movie Trivia Game- Christmas Party Game Idea! Gift Guide | The Cutest Heart-Shaped Gifts!